back to the Asian food store and saw this small bag of potato chips. Sure does look like the ruffles double crunch chips from the USA. The chips did have have the same crunch of the ruffles Double crunch though. 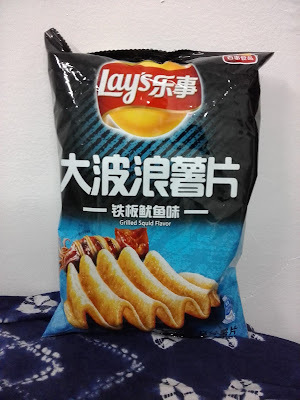 Did this chip have grilled squid flavor!!?!? Had to tell, but I can 1000% say it had some sort of a seafood type flavor going on. The flavor here was not horrible, but then not special. Nor did it have the super duper punch like the lobster flavor Cheetos knockoff I tasted. In the end I will give this flavor a minor thumbs up.